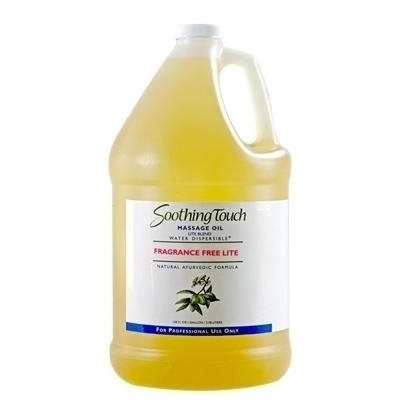 1 Gallon: No fragrance for specific fragrance free use. It also allows you to "scent to preference". Indulge your clients in a relaxing massage using Soothing Touch Ayurvedic Massage Oils. These water dispersible oils lubricate, moisturize and repair the skin, providing antioxidants and nutrients. Enhancing skin contact during bodywork, these healing oils also allow the therapist to release more tension and unblock vital energies with a deep, smooth glide. All of these oils are water dispersible and leave no undesired odors.